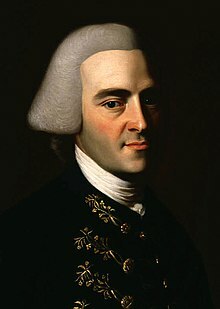 John Hancock (January 12, 1737 – October 8, 1793) was an early American patriot, a leader in the American Revolutionary War, and an American statesman. He was the first man to sign America's Declaration of Independence. In modern America, "John Hancock" is a synonym for signature. Hancock's ancestors arrived in the English colonies in 1652. In 1737, Hancock was born in Braintree (now Quincy, Massachusetts). When John Hancock Jr. his father died, he was adopted by his uncle, a merchant in Boston, Massachusetts. At his uncle's death in 1754, Hancock inherited the business. He became a leading merchant in Boston and one of the wealthiest in the colonies. In 1768, British officials seized his ship, the Liberty. It carried a shipment of wine. The officials said he was smuggling. Boston patriots rioted and he was acquitted. This incident was one of the events that led to the American Revolutionary War. Hancock had several important jobs in Colonial America and the early United States of America. He was president of the Massachusetts Provincial Congress in 1774 and 1775. He used his money to support American independence. The British thought him a very dangerous man. Hancock was president of the Continental Congress in 1774 and 1775. He wanted to lead the Continental Army. George Washington got the job instead. With 5,000 troops, he tried to free Rhode Island from the British. He was not successful. Hancock led the convention that adopted the Massachusetts Constitution in 1780. He was first Governor of the state Massachusetts. He served nine terms. Hancock suffered from gout in his later life. He died in 1793. ↑ 1.0 1.1 1.2 1.3 "John Hancock". Encyclopædia Britannica Online. Retrieved 27 February 2011. ↑ 2.0 2.1 2.2 2.3 2.4 2.5 2.6 2.7 2.8 World Book Encyclopedia. 2012. Volume 9. Scott, Foresman. pp. 38-39.